Jalal Mando originates in Homs, Syria. He studied acting in Damascus. During the Syrian revolution he filmed and took photographs to document the humanitarian crisis. Because of this he ended up in prison where he spent two years. 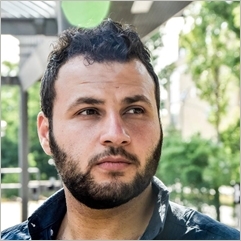 Jalal escaped from Syria and has lived in Germany (Potsdam) since November 2015. In his new homeland he created Farasha with Angélique Préau. Together they make an artistic duo and organize video and photo workshops for refugees and Germans. Right now Jalal is working as actor in Hans Otto Theater (Potsdam) for the play Gehen und Bleiben directed by Clemens Bechtel which will premiere in March 2017. Jalal has attended many courses and workshops at University of the Arts Berlin and Film University Babelsberg Konrad Wolf, which aimed at introducing refugee artists to studying and working as artists in Germany.